In 1988, Archbishop Marcel Lefebvre of the Society of St. Pius X (SSPX) consecrated four bishops against the express orders of Pope John Paul II. The Vatican declared that the archbishop and the new bishops had, by virtue of this act, incurred a latae sententiae (or automatic) excommunication. This brought to a head years of tension between the Society and the Vatican, occasioned by the Society’s disagreement with liturgical and doctrinal changes following Vatican II. Cardinal Joseph Ratzinger, then the chief doctrinal officer of the Church and later to become Pope Benedict XVI, had worked strenuously, if in vain, for a reconciliation. End quote. 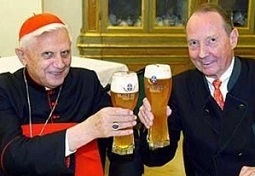 So, according to Cardinal Ratzinger, churchmen can be guilty of scandalizing the faithful by virtue of (a) apparent surreptitious departures from truths and values traditionally upheld by the Church, (b) a lack of clarity, and (c) a tendency to dismiss criticism as politically motivated, an expression of mere nostalgia, etc. After becoming pope himself, Ratzinger would lift the excommunications of the SSPX bishops, affirm the right of all Catholic priests to use the Extraordinary Form of the Mass (i.e. the “Latin Mass”), and begin doctrinal talks with the SPPX -- all in compliance with the conditions the SSPX had set on regularizing its position within the Church. The mythical harshness of the Vatican in the face of the deviations of the progressives is shown to be mere empty words. Up until now, in fact, only warnings have been published; in no case have there been strict canonical penalties in the strict sense. It is true that heterodox progressive theologians like Hans Küng and Charles Curran are not permitted to teach Catholic theology in an official capacity. But these famous dissenters were never excommunicated or defrocked. They maintained their academic careers, their influence within the Church, and the fawning attention of the media. So, both as head of the CDF and as pope, while Ratzinger by no means gave away the store either to the SSPX or to the progressives, he did strive as far as possible to understand and accommodate their concerns. Another example: In 1995, Pope John Paul II’s Evangelium Vitae appeared, and took a very restrictive position on the application of capital punishment. Concerned about the impression that traditional Catholic doctrine on capital punishment was being overturned, Fr. Richard John Neuhaus wrote to Cardinal Ratzinger asking for clarification. Ratzinger did not accuse Neuhaus of a bad spirit, of dissent, of trying to put the pope into a difficult situation, of quibbling about what was already perfectly clear, etc. Rather, he straightforwardly answered the question, reassuring Neuhaus that “the Holy Father has not altered the doctrinal principles which pertain to this issue” but was merely “appl[ying the]… principles in the context of present-day historical circumstances.” And in 2004, Ratzinger further reaffirmed the continuing validity of traditional teaching by making it clear that “there may be a legitimate diversity of opinion even among Catholics about… the death penalty” and that a Catholic could even be “at odds with” the pope on that subject – something that could not be the case if the relevant doctrinal principles had been reversed. [T]he faith of the Church has always insisted that between God and us, between his eternal Creator Spirit and our created reason there exists a real analogy… God does not become more divine when we push him away from us in a sheer, impenetrable voluntarism; rather, the truly divine God is the God who has revealed himself as logos… Consequently, Christian worship is… worship in harmony with the eternal Word and with our reason. This attitude toward reason contrasts sharply with that evinced by many of the critics of the four cardinals and others who have formally and politely asked Pope Francis to clarify Amoris Laetitia and to reaffirm the traditional Catholic teachings that some think are contradicted by that document. Most of these critics have refused to address the substance of the four cardinals’ concerns. They have preferred to question the cardinals’ motives and to issue insults and threats and false statements. They have expressed scorn for the cardinals’ “intellectual discussion” and “sophisticated arguments.” One critic opines that those who sympathize with the four cardinals tend to be “intellectuals” and “educated” people, “who put great store in their reason” and in “arguments, logically developed from absolute first principles… building to a case that cries out to be answered” – as if these were bad things! Even Pope Francis himself has in the past criticized “trust in clear and logical reasoning” as a kind of “Gnosticism”! And yet it is only fair to note that Pope Francis has, like his predecessor, been surprisingly generous even to the SSPX. Evidently his motivation has less to do with concern for doctrinal continuity and rational engagement than with charity and mercy. But perhaps this same charity and mercy will, ultimately, lead him to respond to the four cardinals. Anonymous, the answers are: maybe leaning towards yes, yes, yes, yes. The only danger I see with going to the SSPX is that you're liable to eventually start answering no to the other questions, which is a problem. Other than that, the SSPX cannot be worse than the Orthodox, who are actually in schism, but have valid sacraments nonetheless. Did you not read how Francis reacted to those who he says are trying to block his reformation of the Vatican? He said they are doing the "work of the devil" and need to be "permanently purified." My kind of pope: liberal in his teaching but harsh to his critics. It's going to be a good, long ride, unless, of course, right wing Catholic reactionaries take action against him. But I have a feeling he's considered that possibility. He dealt with far right politicians in Argentina for years. But I have a feeling he's considered that possibility. He dealt with far right politicians in Argentina for years. Did whining, complaining, and ultimately hiding work as good for him there as it's doing here? Because so far, that seems to be the only thing the Pope has been able to rely on. He tried to lecture Trump during the election, and ended up pleading through his subordinate that he was misunderstood. A good, long ride is exactly what this Pope is being treated to, hence his lashing out in frustration. It turns out the Holy Spirit has some plans for him, whose mercy he is at. I would advise against going to SSPX mass, especially if you have an FSSP alternative. The new mass is perfectly valid. So are the confessions. Francis has not committed any formal heresy yet and he is still the pope. Many, even most of the things he does and says are heterorthodox, but that doesn't mean he's no longer a pope. The best thing to hope for now is that God will give us a new pope who will walk in his light as Francis isn't backing down in his assault on the aesthetic which we know as Catholic and he has taken himself up as The Holy Spirit and his critics and servants of Satan. I have battled Reactionary Radtrads all my life. They are tedious extremists and their faults too tedious to rehash here. Given their track record and perchance to cause scandal I can see why Pope Francis would be suspicious of them. But that being said I have zero sympathy for any bishop who refused or refuses to allow at least one Latin Mass or St Pius V rite in his diocese but allows all other sorts of flake nonsense. Then he looks surprised when an SSPX or SSPV types show up at his door leading people astray cause they have no FSSP Mass to go too. Ivan, I hardly dare to comment here when there are so many intellectuals in the comment section - exception for "Son of Ya'Kov" unfortunately - however, with respect to which Mass to attend - might we look at this in a different way? In which Mass is TRUTH evident? I mean in which Mass is The Body and Blood of Jesus Christ treated with the respect that reflects belief in the Real Presence? Do we owe allegiance to this truth that Jesus is present, really and truly, and therefore feel we cannot be in the same room with others who scatter "Sacred Dust" on their person, on the floor, and elsewhere? For me, the answer is clear. All the discussion of what's licit, what's valid, what is allowed etc. is to obscure this truth. In keeping with the point of this post, Cardinal Ratzinger, when he was Pope, dealt with the above difficulties by distributing Holy Communion on the tongue in his later Masses, and was generous, publicly and forcefully, in approving the Latin Mass. In this way he swept excuses for sacrilege away and fostered a return to TRUTH. What do you make of this? Is the Pope changing his mind? *I'm trying to replicate it when two black dudes uses a slur word that they can call each other but no non-black person can use, but I substituted it with the word "Romanist" cause..no way I am going to use that other word. Plus it would be silly anyway. I seem to recall Pope Francis saying, perhaps after Cardinal Burke said some things after the first or second synod, that he appreciates, specifically, Burke's disagreement with him. But then he moved Burke to Malta. > He tried to lecture Trump during the election, and ended up pleading through his subordinate that he was misunderstood. That of course is a lie. If anything it was Trump who over-reacted and admitted as much the day after when he read the Pope's actual words unfiltered. @Greg see my Breitbart link right before your post. and different news sources "spin" it. Including Catholic ones. So the Pope is either welcoming resistance as long as it comes from good will or He is condemning all resistance as malevolent or this is just some backhanded attack on the four Cardinals who wrote the dubia? Why can't the press make up it's mind? I remember my dad once using the word "genuflecter" as a slur he was happy to own (as in "Yeah, damn right I'm a 'genuflecter' and proud of it"). I assume he must have had this label flung at him when he was a boy or something, though I've never heard it elsewhere. "genuflecter"? Reminds me of bead puller. Too bad everyone's running from "Papist" these days. Well, I think I killed this conversation. Sorry. Wine and bread become body and blood even within schismatic groups, primary example would be the Orthodox church. And they share the rite of Divine Liturgy as is, hence on those grounds it would be perfectly fine to go to mass with groups that are in some kind of a schism. But this isn't just about the rite itself, it's about fidelity to the Church. SSPX is in a very strange canonical situation, which Francis isn't helping as their priests now have valid Catholic confession, but are not in full communion with the Church which is a somewhat paradoxical situation. Until further notice, I would personally avoid going to their parishes, especially if you have the alternative. I have it, but only once or so a month and when in town try to attend the FSSP Latin mass (we now finally have a priest in our country who can celebrate it, before we had guests from Austria, Slovenia and other nearby countries). The SSPX is in a pickle(& I would say it was Benedict who did it too them by lifting the excommunications not Francis giving semi-faculties to their Priest to hear confession). They have three choices. 1) Stay in semi-schism and die out when all their Bishops die since they will have no legal authority to get new bishops. 2) Return to full Schism by having their remaining Bishops consecrate new Bishops in order to perpetuate themselves & keep their order alive. This would return them to square one and within a generation they will become a distinct sect like the Eastern Orthodox or the Polish National Catholic Church. 3)Return to the Catholic Church. Williamson the holocaust denier has already chosen 2. "It turns out the Holy Spirit has some plans for him, whose mercy he is at." We are all at the mercy of the Holy Spirit. That would be good for them, for instead of attacks for being too Catholic, they' would receive all those ecumenical warm feelings. Can't you imagine Pope Francis IV praising Archbishop Lefebvre the way Francis (I) praises Martin Luther? I think you are kidding but I am going to answer you seriously cause......I'm bored right now. >That would be good for them, for instead of attacks for being too Catholic, they' would receive all those ecumenical warm feelings. >Can't you imagine Pope Francis IV praising Archbishop Lefebvre the way Francis (I) praises Martin Luther? Yes I can but I note the irony at the comparison between the two. Ivan Knezović, it reads like you're in Hungary. If so, I take my kids weekly to the TLM at Szent Mihaly's on Vaci utca; wonderful Mass, hyper excellent choir, and so on. I've never liked Baroque but when you attend a TLM High Mass in one, you realize what the design is for. It's exquisite. Generally, if you take into account the long history of "Modernists" trying to what, "take over" the Church or "reorient" the Church, "Protestantize" the Church, or however you want to say it, then perhaps what we're seeing now is the set up for a real fight as to what Catholicism is. If the Modernists win, then it's a sort of Anglicanism with some pasta and oregano, and thus not really very interesting, a sort of "Spiritual Body of the Holy Gonands". That sort of Modernist Church attracts no one, or very few (some wag said the Episcopal Church was the National Organization of Women at prayer.) I've seen stats such that only about 7 percent of "Millennial" US Catholics stay in the Church. An astounding number. That Church ought to die out (and no wonder the US bishops are so keen to encourage illegal immigration from Latin American countries as it props up US Catholics stats). But if the Trads win, then the "Magisterium" Catholics, those in the great middle, will mostly stay with the Church and we can go back to being distinctively Catholic. I don't think there's a scenario in which the Magisterium Catholics "win". JPII kept 'em alive (even, really created them; his election saved the Paul6 Church from implosion) and B16 seemed to be leading the way toward the Trads. Francis has jumped heavily on the Progressive/Modernist side, and he's doing us a favor, forcing us to "get off the fence". We either go "full Prot" or "full Trad", one or the other, no more mushy middle. I think that we should get rid of the progressive/conservative label. We are primarily doing ourselves a disservice as we are not conservative, it being a protestant political ideology related to Burke, with whom we have very little in common, assuming we are thomists or augustinians or just adhere to the social teaching of the Church. We, the so called "traditionalists" (myself being often called one, as a 22 year old who went to TLM twice in total, fully a child of JPII. and Benedict XVI., never having read Pius X. and so on) simply adhere to the doctrine, without imposing our own arbitrary anti-doctrinal views for the sake of some vague notion of mercy, that is devoid from justice (reminds me of st. Faustina a lot, who never divorced the two- if we are outside the mercy that God offers us we will suffer his perfect justice, which is indeed terrible). The division is as an article on The Remnant said, between doctrinals and anti-doctrinals. The statistics are probably off in a few ways, as people move away from faith as they grow up and move back into it once they have a taste of the vapid secular life. Ed Feser is the perfect example of this really, as would Alasdair MacIntyre, the two of them being the leading thomists most of us philosophically minded Catholics turn to for answers on various topics. I am also from Croatia and not Hungary. Ah, yes, thanks! Croatia and Hungary had a long relationship and I've an American-Croatian friend who tells me how glad he is that they've parted ways. And I remember working with a Slovakian-American who was such a Spirit of Vatican II sort that he suffered no counter-opinions to the classic Progressive/Modernist Party Line. He asked me not to talk to him about religion, at one point. But he loathed the Magyar (even though his country has a large area of Hungarian-speaking people). Myself, I'm Irish, and thus hopelessly sardonic about it all. I would have hoped that Croatia had a stronger Trad movement, but rejoice to hear it is advancing there. In Hungary, the country has a strong Protestant element (Calvinist) and also the Church gave in to the Communists after Mindszenty was removed by Paul6. IIRC, the Hungarian Church caved to the Communist regime and lost a massive amount of respectability, all as a result of Paul's (or "Good Pope John's") "Realpolitic" or "Ostpolitic" or whatever it was called. (As I suggested earlier, JPII saved the Church from serious collapse, though if you read the Remnant (as you mention you do) Hilary White makes an excellent point that the collapse is long overdue. It is necessary to reboot, as it were, from Vatican II. Anyway, for Hungary, the Church is slowly regaining respect under Cardinal Erdo, or so it is said. But he's not much enamoured, shall we say, of the Trads. As for the Left/Right, Conservative/Liberal (or Progressive), or even (small 'o') orthodox vs. the heretics, we have to use some sort of terminology, and in many ways (not totally, of course) it does tend to mirror the political split. That's complicated by the fact that American Conservatives are Classical Lockean Liberals, whereas in Europe "the Right" can mean quite different things. So "Doctrinals" opposed to the "Anti-doctrinals" works quite well. Many thanks for that ref. And Edmund Burke was a great man, honestly; I don't think he'd be enamoured of John Lock's American avatars. His mother was Catholic and though I've no evidence of it, I'm sure he grew up speaking Irish as well as English. Ireland (and the US) could use a good few more Burkes, but Ireland has become "hard mission territory" for either the Faith or Burkean "Conservatism". And yes, let's thank God for Ed Feser and all the ones who've returned. But in my own extended family, I know of so many who've been lost, seemingly permanently. Hilary White has the right style of positivism about it all, and we can only pray God has mercy, indeed.